MILAN (AP) — A right-wing extremist suspected of shooting six Africans in central Italy was “lucid and determined, aware of what he had done” and exhibited no remorse, an Italian law enforcement official said Sunday. Luca Traini, 28, remained jailed as police investigated him on multiple counts of attempted murder with the aggravating circumstance of “racial hatred” for the Saturday attacks in the Italian city of Macerata. The five men and one woman wounded in the two-hour drive-by shooting spree are from Nigeria, Ghana, Gambia and Mali, according to RAI state television. Italian authorities said they seized Adolf Hitler’s “Mein Kampf,” other publications linked to Nazism and a flag with a Celtic cross, a symbol commonly used by white supremacists, from Traini’s home Sunday. The suspect was an unsuccessful candidate last year in a local election for the anti-migrant Northern League political party. Italy’s ANSA news agency quoted acquaintances saying he previously had ties with the neo-fascist Forza Nuova and CasaPound parties. 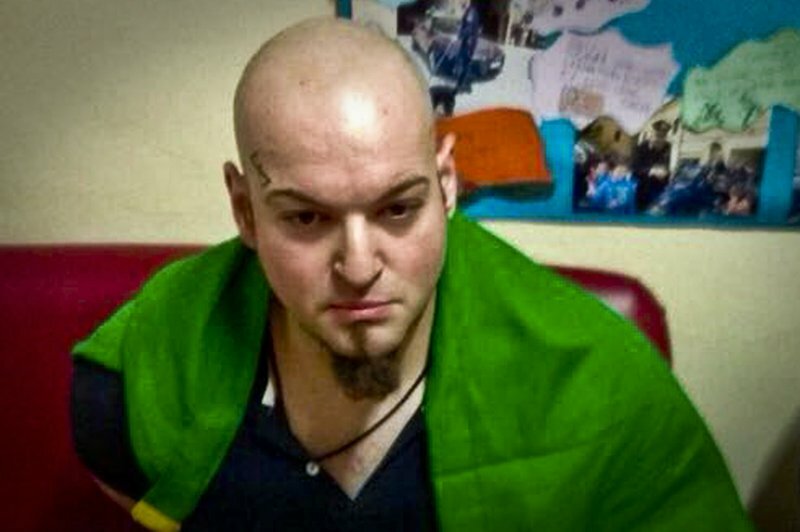 Photographs released by police showed Traini with a neo-Nazi tattoo prominently on his forehead and an Italian flag tied around his neck. Col. Michele Roberti, the Carabineri commander in Macerata, told Sky TG24 that Traini demonstrated no remorse for the two-hour rampage and “it’s likely that he carried out this crazy gesture as a sort of retaliation, a sort of vendetta” for the gruesome slaying of a teenager a few days earlier. A Nigerian man has been arrested in the death of Pamela Mastropietro, 18. Her remains were found in two suitcases days after she walked away from a drug rehab community. Police said her bloody clothes, a receipt from a pharmacy where she bought a syringe, and knives consistent with the crime were found in the Nigerian suspect’s apartment. Roberti ruled out any personal connection between Traini and the slain woman. “I never hurt anyone. I was talking and laughing with three other people” when she was struck by the bullet, she told the Turin-based newspaper. One of the six victims was released Saturday. The remaining patients were all stable, with one in intensive care and Jennifer facing surgery on her shoulder, doctors said Sunday. Her boyfriend told La Repubblica they were waiting at a bus station when he saw a man pointing something at them from a black car. He realized then that it was a gun. “I gave Jennifer a push to get her out of the way and threw myself down. And I heard a shot: Boom!” said Ogie Igbinowania. Jennifer told the newspaper she arrived in Italy seven months ago and joined her boyfriend in Macerata. “I have always been comfortable here. People are friendly. I don’t know why that guy fired at us,” she said. A Nigerian community leader in Macerata, Sammy Kunoun, said he heard the shots as he was going to meet with cultural mediators about organizing a sit-in to support Mastropietro’s family. They called off the event after the shootings for fear of further racist attacks. “Now, we are all victims in this story,” said Kunoun, adding that the immigrant community has been well-integrated in Macerata. Foreigners are 9.2 percent of the city’s 43,000 residents, according to official data. Anti-foreigner sentiment has become a key theme of a heated electoral campaign. Italy has struggled with the arrival of hundreds of thousands of migrants in the last few years coming across the Mediterranean Sea in smugglers’ boats. The general election is scheduled for March 4 and the head of the rebranded League party, Matteo Salvini, had capitalized on the teen’s killing in campaign appearances even before the shooting Saturday. Salvini is pledging to deport 150,000 migrants in his first year in office if his party wins control of parliament — drawing sharp rebukes that he is using the migrant crisis to foment xenophobia for political gain. This version has been corrected to show the shootings happened during the day on Saturday, not at night.